Automatic Gate Release Timer - Stradbally Farm Services ltd. 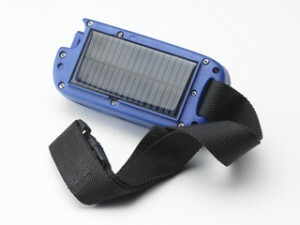 The Batt-latch is the world’s only portable solar-powered automatic gate release timer. Pre-programmed by the farmer, this timer can be used on any gate system, and is particularly suited to dairy farmers. The keypad is simple to use and gives you total control and flexibility to set up and store four release events at a time, for up to two weeks in advance. The full message LCD display screen lets you know exactly what you have programmed in. 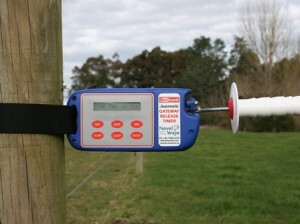 In a paddock situation, the timer and a temporary gate replace the function of the normal gate. Attach the Batt-Latch to one post with its adjustable webbing strap and then hook the supplied spring gate or bungy cord to the latch cam, stretch it across and clip it to the other post, or wire fence. When the preset time is reached, the battery-powered internal motor/gearbox is activated by the timer, the cam turns 360˚ and the spring gate is released, enabling the stock to make their own way to the dairy, feedpad or other destination. Using the Batt-Latch, you can allow the herd access to the paddock at very early hours before even the most energetic farm worker would care to rise. It also suits medium to large farms and herds, and those with long raceways to the dairy. Farmers with multiple herds often buy one or two Batt-Latches per herd, using units to ‘hold back’ after milking and ensuring all of the herd get a chance at new grass. You can also expect stress reduction in the herd, as they travel to feed at their own pace. Some farmers have reported reduced hoof damage when using the Batt-Latch, and this lines up with the new research findings on the causes of lameness. The latest model of the Batt-Latch is designed to release a gate by text command from your mobile phone and is available to purchase from us. By texting different commands to the unit, any function of the Batt-Latch can be controlled as if you had the timer in your hands. I have the PA56, What is the need for this new model? Well, This model is very handy for different reason including ones out of any farmers control. Example; if you are in town and are running late for milking you can easily text the Batt-Latch to delay the release to a later time, after which it will restore itself to its previous setting. Jobs can also be advanced if an earlier release is required. If an unusual rainfall events occurs, and stock remaining in a paddock could cause pugging, they can be release remotely by your mobile phone to a different standoff area. 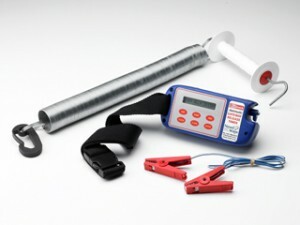 The cellular modem version of the Batt-Latch can also be used to release a second herd with perfect timing as the first herd is finishing milking.